Water Birch, also known as Red Birch, is a waterside plant native to western North America. This multi-stemmed species is ideal for wetlands. It tolerates being planted in heavy clay and wet soil conditions. This tree grows small enough for yards with limited space. 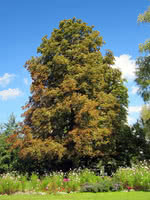 It is an attractive ornamental with reddish non-peeling bark.